Panglao Island, July 14, 2018 – BE Grand Resort, a luxury resort in Brgy. 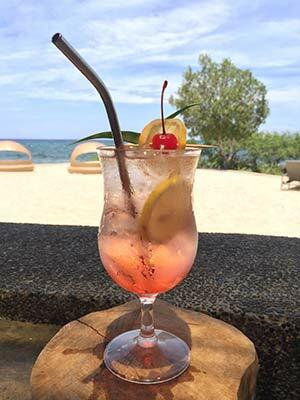 Danao, Panglao Island, ditches the use of plastic straws in all of their five (5) restaurants and bars. The effects of single-use plastic to the environment are rising at an alarming rate and it’s not a secret that Bohol is still yet to perfect proper waste management. Rise of tourists leads to rise of establishments; rise of establishments means increase in resources usage which leads to increase in wastes. While monthly coastal clean-up helps, it’s not the long-term solution. Non-biodegradable wastes end up in our ocean, extending the harm inland to the waters. Big establishments has a higher tendency of facing backlash when eliminating single-use plastic straws as some prefer single-use straws in relation to the idea that it is more sanitary – use once and it gets thrown out. At BE Grand, plastic straws will be completely eliminated and unavailable for use starting July 15th. With an average consumption of 800 straws per month, this will drastically reduce waste and is an assertive way to educate guests the importance in taking part in the drastic effort to reduce plastic use. This is an encouragement for bigger establishments to do the same. BE Resorts Group of Hotels is owned and managed by Cebu-based property developer Enrison Land, Inc. (ELI), a family-owned corporation that shares the values of Filipino excellence for global recognition. BE Resorts currently operates two hotels, namely BE Resort, Mactan and BE Grand Resort, Bohol.